Things go entirely to plan in country number 2 (warning, there’s a twist at the beginning, middle and end). Karakum desert, Turkmenistan to Nukus, Uzbekistan. So, we were rudely awakened by the dustmen aka Mr Dima at about 6am the next morning, just when the sun was starting to come up and we could actually get some sleep. It had been so cold in our desert tent that we’d all just spent the night shivering and hoping that we wouldn’t get hypothermia. Susan, who isn’t too fond of being dragged out of bed at the best of times, was in a horrendous mood so Jill and Vita helped Dima pack the tents up and load the stuff into the jeep while she took her cup of cowboy coffee (made by Dima on the camp fire) down to the gas crater to warm herself up, since it was her birthday after all. There was only 1 other person around the crater so watching the light creep over the desert while DJ Gas Crater hissed and spat was a fine way to spend her first morning as a 40 year old. As magnificent as the sunrise was, it was still DJ Gas Crater who turtelly sturl the shurr and even with lots of attempts it was impossible to catch just how stunning it all was on camera. When she wandered back up again everything was packed up and Susan was in a lot finer fettle so we all piled into the jeep, said a tearful yet fond farewell to the new guest DJ for Marijuana Fuelled Murders and set off for the Uzbekistan border. The time of The Stans has finally arrived – or has it? 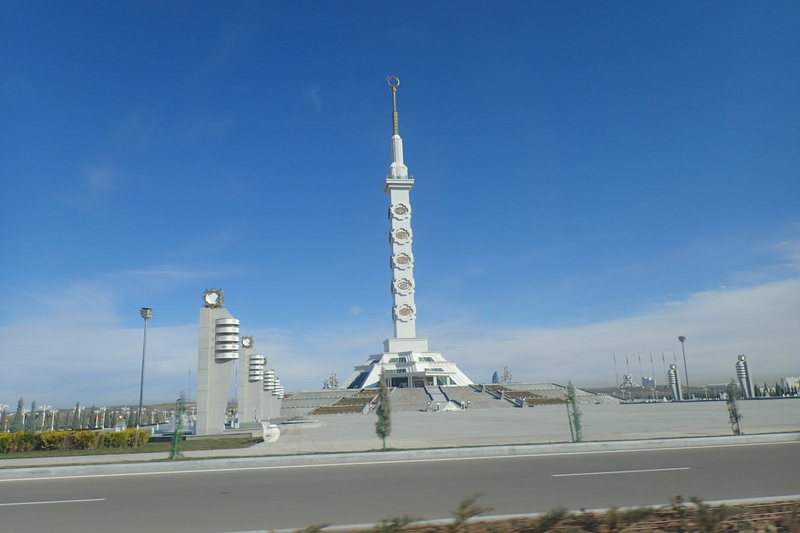 Your heroines take their first pounding: Gatwick, UK to Ashgabat, Turkmenistan. Well, we don’t even know where to start on this one. Just as Susan and Vita were panicking and running through Dublin airport as they had heard a gate closed tannoy for their flight to Gatwick , a message arrived from Jill saying she had boarded the wrong plane and almost flown to Belfast ! Resulting in her missing her Gatwick flight and having to pay a fortune to detour through Heathrow with British Airways instead. After a few hours in the No. 1 lounge in Gatwick of Susan trying to teach Vita how to play playstation, and Vita throwing a variety of pastries around, Jill finally made it to Gatwick and we were reunited as a shark with 3 privvy legs. We celebrated it in style with Bloody Marys and some nice relaxing episodes of Charmed, which made us realise that as we had the power of three we may also possess witchy powers, which we used to refill the porridge kettle with chilli – coincidence? We think not! Focussing our witchy powers in the No. 1 lounge in Gatwick. On top form and with joy in our hearts we merrily skipped to the gate to catch our flight to Moscow, from where we had a harrowing 6 hour wait in the lounge with free bar and food to catch another flight to Ashgabat. Upon proudly displaying our boarding passes to the gate keepers we were asked where our visas for Moscow were, well we don’t need any as we are only transiting and not leaving the airport (we had done much research on the subject and found that this was all fine and dandy so were certain of our status), to which they replied “Easyjet is a point to point airline and as such we don’t do transit”. A phrase which was about to be burned into our brains from hearing it repeatedly during the next few hours. Whilst on the phone to the manager, Phillipe, we sadly watched our flight to Moscow depart down the runway, so close and yet so far away. An emotion to which we were about to become very accustomed. Heads still held high and refusing to be cowed by The Man we defiantly strode back to the obvious next outpost, Wetherspoons, to weigh up our options. Read on to see if anything goes right!